Bronx Arena has built a competency-based model so that students get a personalized learning experience and are truly able to accelerate or slow down based on their optimal speed of learning. Originally, the process started with using the Common Core State Standards as compentecies. Educators and administrators realized that this language was too vague and not easily comprehensible by students. Since students own their own learning at Bronx Arena and need to be able to interact with and understand the competencies, they decided to build new ones. These new competencies are a combination of skills that have been foundational to academic success for centuries (e.g. reading, writing, arithmetic) and those that will likely be required for success in the 21st century (e.g. technology, self-management). At Bronx Arena, students do not have to stretch themselves over six to eight classes but, instead, focus their energy on three sections: Learning Lab, a primary credit, and a secondary credit. With their flexible schedules, they can go deep into one competency for up to four hours and also have flexibility to schedule time for one-to-one conferencing and goal-setting with their teachers. This allows students to achieve a credit in as little as six weeks because their courses are customized with a pathway that meets their specific needs, based on their individual progression and goals. Provides transcript from previous schools, helping educators identify course gaps. How to be a student at Bronx Arena. General assignments that help identify areas of academic and social-emotional strengths and weaknesses. Takes entry assessments before starting subject courses (math, ELA, science, social studies). Identifies primary credits, secondary credits, and daily tasks to complete them. 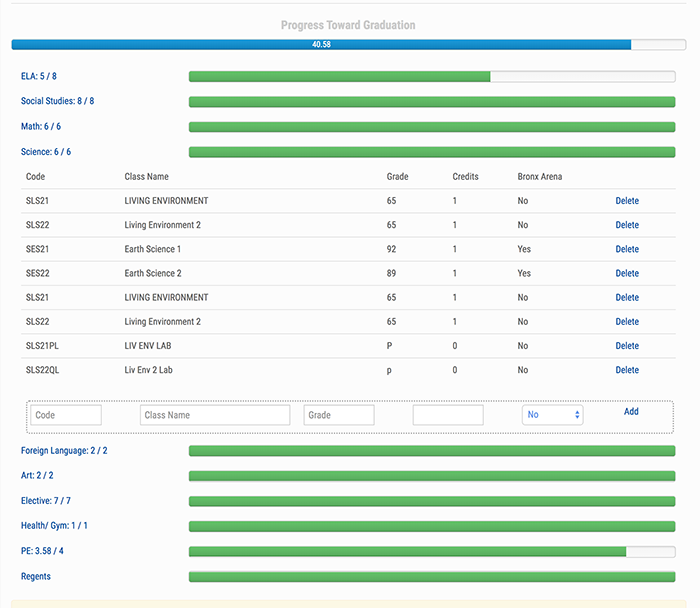 Tracks progress of competencies and credits through an online tracker. Analyzes previous transcripts, with the help of administrators, to determine which courses students still need to take in order to graduate. Investigates entry assessments to determine appropriate starting points for each student in each subject area. Monitors student progress to determine where each student is and what they need that day, based on data. Manages multiple courses through an online tracker and identifies areas of intervention or acceleration. Tracks mastery of competencies and credit achievement through an online data tracker. Supports mastery through unique course offerings like project application and online exploration.